After the recent victory over Bahrain in a FIFA World Cup qualifier, where the Socceroos were completely outplayed for most of the match but still managed to win, there may be some truth in the claim that the ‘Curse of the Socceroos’ may finally be over. Johnny Warren’s 2002 autobiography, “Sheilas, Wogs and Poofters”, raised the notion of the curse, and it goes something like this. During a trip to play against Rhodesia (Zimbabwe) in the 1970 World Cup Qualifier in Mozambique, members of the Socceroos consulted a witch doctor. The witch doctor buried bones near the goal posts and cursed the opposition, and Australia went on to beat Rhodesia 3-1. However, the move backfired when the players could not come up with the £1000 demanded by the witch doctor as payment and he subsequently cursed the team. The Socceroos failed to beat Israel and did not qualify. The curse was supposedly lifted by John Safran during his 2004 TV series John Safran vs God. 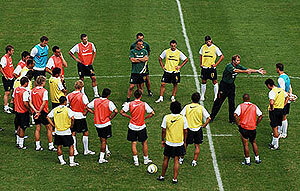 The following year, the Socceroos not only qualified for the 2006 World Cup, but were quite successful, reaching the second round before finally falling to Italy with a last kick of the game penalty in Kaiserslautern. Sports fans and players can be very superstitious people often going through exact routines before games, like wearing the same coloured underwear as they wore last time they won and tying their shoe laces in the same order. A curse on Melbourne Demons AFL club is used to explain why they have failed to win a premiership since it sacked Norm in the middle of the 1965 season. Smith had coached fourteen years and won six premierships, including the previous season, but his relationship with the club grew strained and the multiple premierships winning coach was sacked. He attacked the club in the media following his dismissal, and claimed they would never win another premiership, which has remained true to this day. The Chicago Cubs blame their 99-year World Series drought on a curse placed on the team by a Greek immigrant, annoyed that his pet goat was ejected from the 1945 World Series game at Wrigley Field. Legend has it that Billy Sianis took the goat, which had been left outside his tavern with a sign pinned on it reading, ‘We got Detroit’s goat’, to game four against the Detroit Tigers. But Sianis and the goat were ejected from the stadium by Cubs owner, Philip Knight Wrigley, due to the animal’s smell. The Cubs lost the World Series and Sianis wrote to Wrigley saying, ‘Who stinks now?’ The Cubs haven’t won a National League pennant or played in a World Series since – the longest drought in Major League history. The statue of founding father William Penn atop Philadelphia City Hall has watched over the city for generations, with a gentlemen’s agreement prohibiting any building rising above the statue. But in March 1987, the 945ft One Liberty Place skyscraper was completed, dwarfing Penn’s statue. Beforehand, Philadelphia teams had enjoyed an enviable run of success – including NBA and World Series – but since then, the four Phillie franchises have endured a run of narrow failures. The Phillies lost the 1993 World Series, the 76ers lost the 2001 NBA Finals and the Eagles lost Super Bowl XXXIX. In an attempt to end the curse, locals have attached a small figurine of Billy Penn to Philadelphia’s new tallest building. Swansea football fans have often cursed the performances of their side through the years – but could the club’s roller coaster history be down to evil spirits? Celebrity physic Uri Geller claimed he could feel the presence of black spirits lurking in their former Vetch Field home in 2001. Michael Jackson’s spoon-bending buddy also insisted the mysterious presence was the reason why Tich Evans, Swans star of the 1920s, committed suicide at the ground. The club took his words seriously, hiring Kenyan dancers to perform a voodoo act on the pitch – but the curse won out in the end – the ritual was cancelled due to a waterlogged pitch. Kentucky Fried Chicken founder Colonel Harland Sanders is said to have placed a curse on Japanese baseball team, Hanshin Tigers. The Kansai-based team have not won a Japan Championship Series since 1985 and fans blame the drought on the, ‘Curse of the Colonel’. Following The Tigers’ only Championship victory over the Seibu Lions, raucous supporters chanted each player’s name as a fan resembling the chosen player leapt from the Ebisubashi Bridge and into the canal beneath. Unfortunately, nobody looked like Randy Bass, so fans tossed a plastic statue of the Colonel from the nearby KFC off the bridge as both had a beard and were foreign. The Tigers fate was thereby sealed. Many attempts have since been made to recover the statue in a bid to lift the curse, but to no avail. So has the ‘Curse of the Socceroos’ finally been broken and can we now look forward to many years of guaranteed FIFA World Cup qualification.